Twenty years of working in the produce industry duly prepared Belleville resident Darnell Lee for the March 9 grand opening of his company Just Produce’s second regional location, this one in the Metro East. Thanks to one-on-one business counseling and expertise provided by the Illinois Metro East Small Business Development Center at Southern Illinois University Edwardsville, Lee is seeing phase two of his dream coming true. For nine years, Lee has been operating a thriving produce business, Just Produce, in three prime spaces at Soulard Farmers Market in St. Louis, offering an array of farm-fresh produce including peppers, pumpkins, tomatoes, corn, strawberries, peaches, watermelon, cantaloupe and more. Success on the west side of the Mississippi River led Lee to grow his business eastward and open a second location in O’Fallon, Ill. - Just Produce Farmers Market. Five years ago, Lee contacted the SBDC for assistance in growing his business. SBDC Interim Director and Small Business Specialist Jo Ann DiMaggio May sat down with Lee and offered guidance and expertise in areas including business plan review, and contacts with related professionals in commercial real estate, accounting and microlending. One of those connections the SBDC made happen was with microlender Justine PETERSEN. The nonprofit lending organization provided Lee with a $9,500 loan so he could purchase and renovate an existing 1,500-square-foot structure in O’Fallon along West U.S. 50, near Rothman Furniture & Mattress. “Jo Ann worked diligently with me, making sure my questions were answered, and I had the people I needed to help me every step of the way,” Lee said. “She provided all the necessary resources and information to put my life-long dream into effect, and she patiently guided me through the steps, so I didn’t feel overwhelmed by it all. May said working with Lee has been a rewarding opportunity. For more information about Just Produce Farmers Market, see the company’s Facebook page. 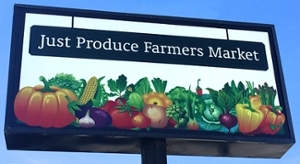 Just Produce Farmers Market is located at 1727 West U.S. 50 in O’Fallon. Daily hours of operation are 8 a.m.-7 p.m. The Illinois SBDC at SIUE assists new businesses like Just Produce Farmers Market and existing businesses headquartered in the nine-county Metro East region of Calhoun, Jersey, Madison, Bond, Clinton, St. Clair, Washington, Monroe and Randolph. It is a no-cost service to the community supported by the U.S. Small Business Administration, Illinois Department of Commerce & Economic Opportunity, and Southern Illinois University Edwardsville.